NGF exerts a variety of actions including promotion of neuronal differentiation and survival. The PC12 rat pheochromocytoma cell line has proved valuable for studying how NGF works and has revealed that the NGF mechanism includes regulation of gene expression. Accordingly, we used SAGE (Serial Analysis of Gene Expression) to compare levels of specific transcripts in PC12 cells before and after long-term NGF exposure. Of the approximately 22,000 transcripts detected and quantified, 4% are NGF-regulated by 6-fold or more. Here, we used database information to identify transcripts in our SAGE libraries that encode ribosomal proteins and have compared the effect of NGF on their relative levels of expression. Among the transcripts detected in our SAGE analysis, 74 were identified as encoding ribosomal proteins. Ribosomal protein transcripts were among the most abundantly expressed and, for naive and NGF-treated PC12 cells, represented 5.2% and 3.5%, respectively, of total transcripts analyzed. Surprisingly, nearly half of ribosomal protein transcripts underwent statistically significant NGF-promoted alterations in relative abundance, with changes of up to 5-fold. Of the changes, approximately 2/3 represented decreases. A time course revealed that the relative abundance of transcripts encoding RPL9 increases within 1 hr of NGF treatment and is maximally elevated by 8 hr. These data establish that NGF selectively changes expression of ribosomal protein transcripts. These findings raise potential roles for regulation of ribosomal protein transcripts in NGF-promoted withdrawal from the cell cycle and neuronal differentiation and indicate that regulation of individual ribosomal protein transcripts is cell- and stimulus-specific. Nerve growth factor (NGF), a prototypical neurotrophic factor and a member of the neurotrophin family, promotes a wide range of responses in its target cells. These range from neuronal differentiation, maintenance of survival, and regulation of metabolic activities [for review see [1–3]. Many of these actions include and require transcriptional regulation [4, 5]. However, the greater part of the changes in gene expression that underlie the NGF response remain to be elucidated. The PC12 line of rat pheochromocytoma cells  has proved to be a particularly favorable system for detecting NGF-responsive changes in gene expression [7–11]. These cells resemble sympathico-pheochromo-blasts and upon exposure to NGF cease proliferation and acquire, in a transcription dependent mechanism, many of the properties of post-mitotic sympathetic neurons including neurite outgrowth and electrical excitability. The robust nature of the response of PC12 cells to NGF coupled with their capacity to be examined both before and at various times after exposure to the factor has greatly facilitated study of the NGF mechanism of action, including gene regulation . To obtain a comprehensive and quantitative over-view of NGF-promoted gene regulation, we  have used SAGE (Serial Analysis of Gene Expression). In this technique [13–15] cellular transcripts are converted to SAGE "tags" which are sequenced, quantified and, in many cases, matched with known genes. By comparing SAGE profiles for cells in different states (as for example before and after exposure to NGF), it is thus possible to obtain a comprehensive view of gene expression and regulation. Moreover, if a sufficient number of SAGE tags are analyzed, changes in expression levels of individual transcripts can be associated with a high level of statistical significance . Initial analysis of approximately 157,000 SAGE tags from PC12 cells cultured without or with NGF for 9 days revealed nearly 800 transcripts (of a total of at least 21,000) that are regulated by ± 6-fold or greater in response to NGF . Of these, approximately 150 were assignable to named genes of known functions that regulate cellular behaviors ranging from actin and microtubule cytoskeleton assembly/disassembly, gene transcription, RNA processing, neurotransmission, and energetics. A variety of criteria supported the reliability of the quantitative findings revealed by our SAGE analysis . In the present study, we have extended our SAGE profiling of naïve and long-term NGF-treated PC12 cells to over 163,000 tags representing over 22,000 unique transcripts. Analysis of these reveals the presence of transcripts encoding 74 different ribosomal proteins (RPs). Surprisingly, we find that long-term NGF exposure leads to statistically significant changes in relative abundance of at least half of these transcripts by factors of up to nearly 5-fold. In addition, a time course for one of the RP transcripts (encoding RP L9) reveals that its relative abundance begins to change within 1 hr and is maximally regulated by 8 hr of NGF exposure. SAGE libraries were generated and analyzed as previously described  from matched sets of PC12 cells before and after 9 days of exposure to NGF. The present analysis is based on 76,280 15-mer tags from NGF-untreated PC12 cells and 87,004 tags from NGF-treated cells (after exclusion of duplicate ditags, mitochondrial transcripts and repetitive elements). Consideration of tags observed twice or more between the two libraries indicated the presence of approximately 22,000 unique transcripts. Of these, approximately 10% were regulated by more than 3-fold in response to NGF and approximately 4% by 6-fold or more. Transcripts represented by SAGE tags were identified by direct matches of tags with the appropriate sequences of known rat genes (present in GenBank) or through matches of tags with appropriate sequences of rat ESTs (present in NCBI Unigene) that were in turn found to overlap with known rat genes. Positive identification required that the transcript or EST have a poly adenylation signal and poly A tail, and that the tag followed the most 3' CATG of the transcript. In this way 74 tags were unambiguously assignable to known rat transcripts encoding proteins described as ribosomal components. Available sequences encoding rat ribosomal proteins L15 and S8 do not contain a CATG sequence and hence SAGE tags for these could not be identified. In addition, rat sequence data for transcripts encoding RPs L2, L25, L33 and S1 are not presently available in GenBank or Unigene. Table 1 lists the tags in our libraries corresponding to transcripts for ribosomal proteins along with their relative abundances. Considering that the eukaryotic ribosome contains approximately 82 proteins, our analysis includes transcripts encoding a major proportion of the known ribosomal proteins. Rat SAGE tags and the corresponding ribosomal proteins (and GenBank accession numbers) are given along with the number of times each tag was detected. For cells before and after NGF treatment, a total of 76,280 and 87,004 11 bp tags were analyzed, respectively. Tag numbers for non-treated cultures were normalized against those for NGF treated cultures. P values were calculated by Monte Carlo simulations using SAGE software. Fold changes in which P ≤ 0.01 are expressed in bold. Among the information provided by analysis of SAGE data is the relative abundances of transcripts. The data given in Table 1 and Figure 1 show the relative abundances of transcripts for PC12 cell ribosomal proteins with respect to one another as well as with respect to the total cell complement of transcripts. As noted above, our analysis has detected at least 22,000 unique transcripts in PC12 cells. The 74 ribosomal protein transcripts identified here thus account for no more than 0.33% of this total. By contrast, for NGF-untreated and -treated PC12 cells, tags corresponding to the 74 identified RP transcripts represent 5.2% and 3.5%, respectively, of total tags analyzed. As anticipated, this clearly places transcripts for ribosomal proteins as a whole in the high abundance category. Relative abundances of RP transcripts before and after long-term NGF treatment. A. Transcripts for RP L3–L41 and P0–P2. B. Transcripts for RP S2–S30 and 40 KD RP. Relative abundances were calculated on the basis of total numbers of tags evaluated and numbers of tags corresponding to each RP transcript. The most abundantly expressed ribosomal transcripts in NGF-untreated PC12 cells included those encoding ribosomal proteins S15, S24 and L41. These each accounted for approximately 0.2–0.35% of total cell transcripts. The high relative abundance of these ribosomal transcripts in NGF-untreated cells can be appreciated by the observation that of the 4 tags encountered more than 200 times in our analysis, 2 (S15 and S24) encoded ribosomal proteins; moreover, RP transcripts represented 6 of the 13 tags encountered from 100–200 times and 23 of the 36 tags encountered from 50–100 times. The data in Table 1 and Figure 1 show that NGF treatment resulted in an overall decrease in relative abundance of transcripts encoding RPs (from 5.2% to 3.5% of total). This may reflect in part our observation that NGF treatment increases the numbers of transcripts representing low-abundance genes . Nevertheless, transcripts for ribosomal proteins remained among the most highly expressed in the NGF-treated cells. For instance, tags for RPs L13A, L31, L37A, S24 and S29 had relative abundances of 0.1% or more. Of the 56 most abundantly expressed tags in NGF-treated cells, 21 represent ribosomal transcripts. In addition to yielding an overall decrease in the abundance of RP transcripts relative to total cellular transcripts, long-term NGF treatment also promoted selective changes in relative expression of transcripts encoding individual RPs (Table 1, Figs. 2,3). Monte-Carlo simulation analysis of the SAGE data indicated that nearly half (a total of 35) of the 74 RP transcripts underwent changes that were significant at the P ≤ 0.01 level (see Table 1). Of these 35 transcripts, 2/3 were down-regulated in response to NGF. Distribution of changes in RP transcript expression caused by long-term exposure to NGF. Changes in expression are expressed as fold up- or down-regulation by NGF. Up-regulated transcripts are given as the ratio of normalized tag numbers +NGF/-NGF and are expressed as positive values. Transcripts that are down-regulated by NGF are given as the ratio of normalized tag numbers -NGF/+NGF and are expressed as negative values. 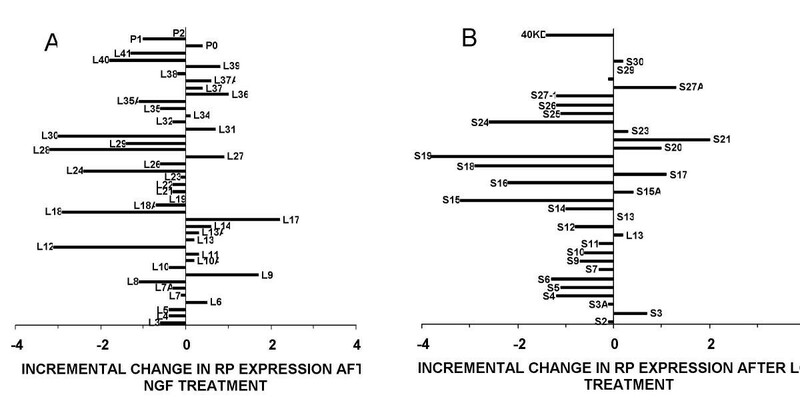 Incremental changes in expression of RP transcripts evoked by long-term treatment with NGF. NGF-promoted changes in expression of RP transcripts are given in incremental units. Up-regulated transcripts are given as [(number of normalized tag numbers + NGF/number of normalized tag numbers - NGF) - 1] and are thus expressed as positive values. Transcripts that are down-regulated by NGF are given as –[(number of normalized tag numbers - NGF/number of normalized tag numbers + NGF) - 1] and are thus expressed as negative values. For transcripts that do not change expression in response to NGF, the incremental change is zero. A. Transcripts for RP L3-L41 and P0-P2. B. Transcripts for RP S2-S30 and 40 KD RP. Figure 2 shows the distribution of fold-changes in transcript levels in response to NGF. 47 of the 74 RP transcripts were either invariant or showed changes of 2-fold or less; 10 individual transcripts decreased by 3–5 fold (L12, L18, L24, L28, L30, S15, S16, S18, S19 and S24) and one was elevated by more than 3-fold (L17). In a past study , the differences in NGF-promoted gene expression revealed by SAGE analysis of our libraries were found to be highly reliable based on 1) the absence of regulation shown by a number of anticipated "housekeeping" genes including β-actin, 2) the observation that the vast majority of transcripts were not responsive to NGF, 3) the detection of anticipated changes in expression of a number transcripts previously reported to be NGF responsive, and 4) the agreement in relative expression of 20 genes as revealed by SAGE and northern blot analyses. To further confirm the reliability of our SAGE findings, we used real time quantitative PCR to compare levels of 5 different RP transcripts in PC12 cells treated with or without NGF for 9–12 days. As shown in Figure 4, both techniques revealed similar changes in expression. Comparison of effects of long-term treatment with NGF on expression of RP transcripts as determined by SAGE and real-time PCR. 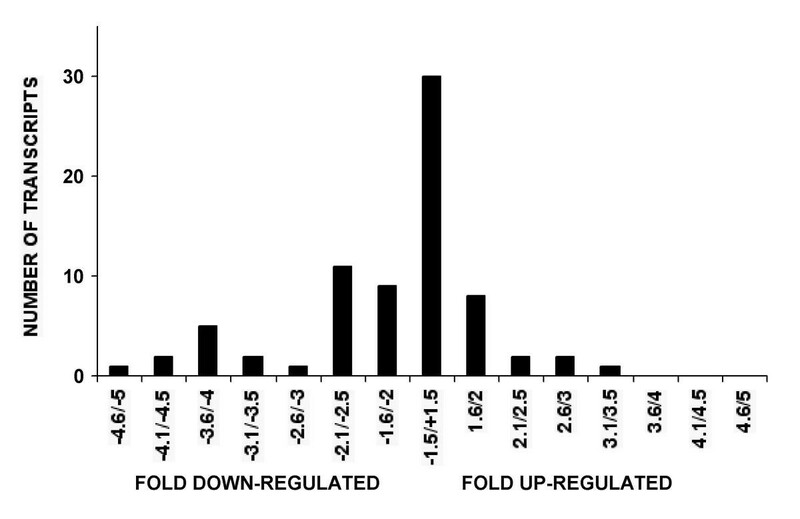 Changes in expression are expressed as fold up- or down-regulation by NGF. Up-regulated transcripts are given as the ratio of normalized tag numbers +NGF/-NGF and are expressed as positive values. Transcripts that are down-regulated by NGF are given as the ratio of normalized tag numbers -NGF/+NGF and are expressed as negative values. Values for real-time PCR are given as means ± SE (n = 4-6) and were normalized against the levels of beta actin message. We next determined the time course with which NGF regulates an RP transcript. For this purpose, we studied RP L9 which undergoes a 2.7-fold elevation in response to long-term NGF treatment. Because the changes in expression are relatively small, we used real time PCR for this end. 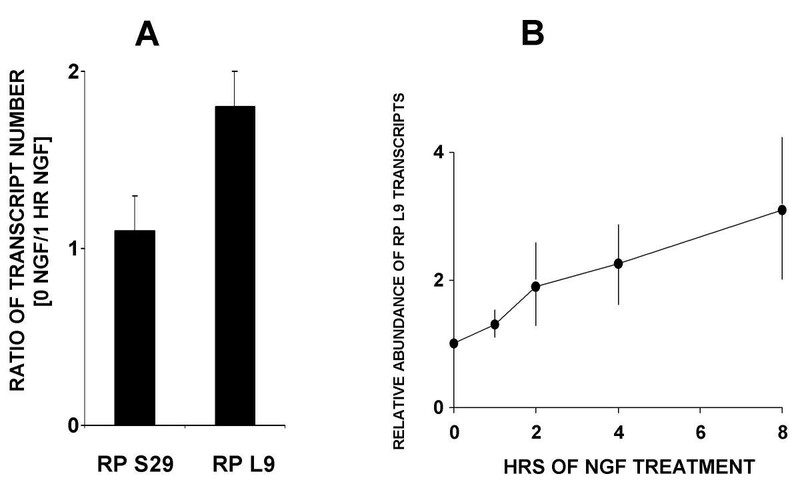 As shown in Figure 5A, the relative abundance of transcripts encoding RP L9 were significantly upregulated by 1 hr of NGF treatment (1.8 ± 0.2-fold, n = 14) whereas there was no significant change in transcripts encoding RP S29, which does not undergo long-term NGF regulation. A time course (Figure 5B) revealed that elevation of L9 transcripts reaches maximal levels within 8 hrs of NGF exposure. Rapid regulation of RP L9 transcripts by NGF. A. Elevation of RP L9 transcripts after 1 hr of NGF exposure. PC12 cell cultures were treated with or without NGF for 1 hr and used for preparation of RNA and cDNA. Relative levels of L9 and S29 transcripts were determined by real-time PCR with normalization against levels of transcripts for GAPDH. Data are given as ratios for values of [NGF treated/untreated] and are expressed as means ± SE (n = 14 for L9 and n = 6 for S29). B. Time course for NGF response of transcripts encoding RP L9. PC12 cultures were treated with NGF for the indicated times and used for preparation of RNA and cDNA. Relative levels of L9 transcripts were determined by real-time PCR with normalization against levels of transcripts for GAPDH. Values are given as means ± SE (n = 3). In the present work, we used SAGE profiling to identify and quantify the relative numbers of transcripts for 74 ribosomal proteins in rat PC12 cells before and after long-term exposure to NGF. This has permitted us to detect selective changes in transcripts encoding specific RPs. A number of criteria support the reliability of our findings. The first regards the assignment of SAGE tags to specific RP transcripts. We required that all matching ESTs or transcripts have clearly definable poly A tails and poly adenylation signals. Due to the extensive data base for rat RP transcripts, it was possible to make all matches with rat sequences. In addition, we used 15 mer (CATG +11) base SAGE tags for our analysis; we have reported  that this leads to a significantly more reliable matching of SAGE tags to genes than with the often-used 14-mer tags. A second indicator of reliability stems from prior analysis of our SAGE libraries and data obtained from them . For instance, we have shown that our SAGE libraries show little or no NGF-promoted changes in tag numbers for transcripts encoding a number of housekeeping proteins. Moreover, a number of transcripts previously found by alternative technologies to respond to NGF treatment, showed similar changes in our SAGE profiling study. Finally, Northern blot analysis verified SAGE-predicted responses of over 20 transcripts to NGF treatment. A third criterion for reliability was that Monte Carlo simulation indicated that many of the NGF-promoted responses of RP transcripts were at a probability of P < 0.01. Because of the relatively high abundance of many RP transcripts, even comparably small changes in expression could be detected at this level of significance. A last criterion was that we used real time RT-PCR to verify effects of NGF on five RP transcripts. A previous study by Lee et al. , based on comparison of a total of approximately 7,000 random ESTs from naïve and NGF-treated PC12 cells, reported an NGF-promoted increase in expression of RPL7 transcripts and a decrease in RPL19 transcripts. This contrasts with the current data which revealed no significant change in expression of either of these transcripts. The reason for this discrepancy is unclear, but could in part originate from the relatively small number of transcripts that were surveyed in the former study. To our knowledge, there are currently no other reports regarding effects of NGF on levels of ribosomal transcripts. A recent SAGE study of targets for N-myc in a human neuroblastoma cell line , reported relative abundances for 66 RP transcripts. The existence of such data permit us to compare the relative levels of RP transcripts in two cell types (neuroblastoma and pheochromocytoma) of related origin (i.e., neural-crest-derived) that both have the potential for neuronal differentiation. The 74 RP transcripts detected here represented 5.2% of the total transcripts in NGF-untreated PC12 cells and 3.5% after NGF treatment. By contrast, the 66 RPs reported in the neuroblastoma study accounted for 4.1% of total transcripts for cells without N-myc over-expression and 12.6% for such cells transfected with N-myc. Thus, for non-N-myc transfected neuroblastoma cells and PC12 cells (± NGF) the contribution of total RP transcripts lies in a similar range and this parameter is greatly elevated in neuroblastoma cells by N-myc over-expression. With respect to transcripts for individual RP's, there are many similarities as well as several striking differences between the two cell types. When NGF-untreated PC12 cells are compared with non-transfected neuroblastoma cells, of the 55 RP transcripts detected in common for both systems, about half (a total of 28) have relative abundances within a factor of 2. Twenty transcripts are more than 3-fold higher in relative abundance in PC12 cells. In two of these cases (S9 and S17) no tags were detected in the non-transformed neuroblastoma cells; in several other cases (S12, S24, L24) the relative abundance in PC12 cells was over 20-fold that in the neuroblastoma cells. For most of these, expression of N-myc elevated the neuroblastoma levels to relative abundances within 2-fold of those in PC12 cells. However, for L24 and S24, the relative abundance in N-myc-expressing neuroblastoma cells was still 1/3 that in PC12 cells. Finally 7 RP transcripts (L7, L11, L21, L30, S7, S8 and P2) were of 3–5 times lower abundance in PC12 cells than in neuroblastoma cells and this difference was appreciably enhanced when the NB cells were transfected with N-myc. We have also compared our RP results with those for SAGE carried out with pooled human adult brain (tissue supplied by Gregory J. Riggins: http://www.ncbi.nlm.nih.gov/sage/sagerec.cgi?rec=161). 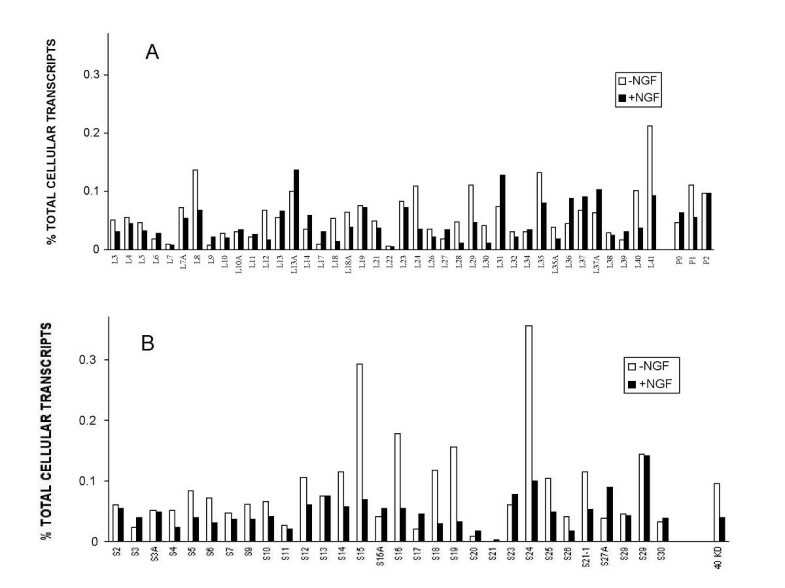 Comparison with data for NGF-treated cells reveals similarity in relative abundance within a factor of 2 for 39 of the 57 RP transcripts in common between the libraries and 48 of 57 to within a factor of 3. However, several large differences do occur. For example the relative abundances of transcripts encoding RPs L9, L39, S24, S13, and S17 are 5–10-fold higher in NGF-treated PC12 cells than in the pooled brain library and transcripts for RP L28 are 8-fold lower. These observations reinforce the notion that expression of individual RP transcripts can be significantly variable from cell type to cell type as well as sensitive to extrinsic signals. Although the ribosome has been considered as a "molecular machine" , it is of interest that the transcripts encoding individual proteins of this organelle are subject to regulation by NGF. Two related questions emerge regarding these findings: how do these changes compare with previous reports for regulation of RP transcripts and what might be the functional consequences of these changes? A number of studies have employed a variety of techniques to detect changes in gene expression associated with the oncogenic state and have reported selective elevation of specific RP transcripts in tumors. Examples include RPs L7a, L37 and S14 in prostate tumors and cell lines ; RPs L5, L7A, L18, S3, S6, S8, S12, S13, S28, P0 and P1 in colorectal cancers and cell lines [21–26]; L5 in astrocytomas ; L18a in squamous cell carcinoma ; L19 in breast tumors that over-express erbB-2 ; RPs S3A, S4, and S17 in lymphoid malignancies ; L38, S4, P0, and P1 in rhabdomyosarcoma cell lines ; and P0, P1, P2, L5, L9, L35, L39, S3A, S10, and S17 in liver tumors . In addition, as noted above, a recent SAGE study identified targets of N-myc in a human neuroblastoma cell line . Of 114 up-regulated genes detected, 66 encoded RPs with elevations ranging from 40% to 37-fold. Several of these genes were also up-regulated by c-myc. Taken together, these findings indicate that the transition to the transformed state is associated with elevation of various RP transcripts. A potential interpretation of such observations is that this up-regulation reflects the enhanced rate of cell division in tumor cells and the requirement for greater levels of protein synthesis. In agreement with this possibility, transcripts encoding RPs L6 and S7 are reported to be up-regulated in regenerating liver . However, for the study involving responses of neuroblastoma cells to N-Myc, despite the massive up-regulation of RP transcripts, there was no over-all increase in the rate of protein synthesis . Before considering potential functional consequences of the changes in RP expression described here as well as elsewhere, it must be conceded that changes in transcript abundance may not necessarily lead to changes in protein expression. The present lack of available antibodies/antiserum to most mammalian RPs hampers such a determination. However, even if cases occur in which altered RP transcript expression does not lead to changes in expression of the corresponding protein, our and others' findings regarding selective regulation of RP transcripts would then raise the interesting issue as to why, and the mechanism by which, transcript and protein expression are uncoupled. If at least some of the NGF-promoted alterations in RP transcript abundance lead to changes in expression of the corresponding proteins, what might be the functional consequences? In the present system, NGF converts proliferating PC12 cells to a non-proliferating neuronally differentiated state. Our findings reveal that the relative overall abundance of transcripts for RP proteins fell by 1/3 in response to NGF. In addition, nearly half of the individual RP transcripts detected showed significant changes in expression and approximately 2/3 of these were decreases. This overall decrease in NGF-promoted RP transcript expression and the preponderance of decreases in expression of specific RP transcripts compared to increases would favor the interpretation that the changes observed here reflect, at least in part, the transition to the non-dividing phenotype. On the other hand, we observed that many of the RP transcripts did not show significant responses to NGF and that a number showed increases in expression. This suggests that the situation is likely to be more complex with individual RPs perhaps playing specific roles not simply associated with the state of cell proliferative capacity. In agreement with this, we found no significant change in expression of RP S29 transcripts even though these have been reported to be present at low levels in growth phase cells and elevated in quiescent cells . In addition to leaving the cell cycle, NGF-treated PC12 cells undergo neuronal differentiation. This raises the possibility that some of the observed changes, as for many other NGF regulated genes, is related to acquisition of the neuronal phenotype. An analysis of gene regulation in human NTERA2 cells induced to leave the cell cycle and neuronally differentiate in response to retinoic acid revealed decreases in RP transcripts including L3, L7, L8, L10, L13, L39, S2, S6, S13, S16, S20, S19, S23, S27A and P0 . Of these, In the present study only RP transcripts L8 and S6, S16, S19 showed significant down regulation in response to NGF whereas the others found in the NTERA2 study either did not show changes that were significant at the P ≤ .01 level or underwent a significant increase (RP S27A). Curcic et al. reported that differentiation of BC3H1 myocytes is accompanied by a drop in L32 gene transcription; in contrast, we found no significant change in transcripts encoding this RP. In another study, RPs L35a and S5 were down regulated during murine erythryolukemia cell differentiation ; we also observed decreases in these transcripts. Mutation of RP S19 is associated with Blackfan's anemia and therefore appears to play a selective role in differentiation/proliferation of erythropoetic cells . Here, NGF resulted in a nearly 5-fold drop in S19 transcripts. Thus, although changes in expression of specific RP genes may be associated with differentiation, the pattern of such changes may reflect the particular cell type and differentiation stimulus that is involved. Another condition associated with changes in RP expression is apoptotic death. RP L4/L1 transcripts, which were not significantly affected by NGF, are selectively upregulated in PC12 cells prior to 5 aza cytosine-induced death and over-expression of this gene in COS-7 cells induces apoptosis . Over-expression of L7, L13A, S29 have been also reported to induce apoptosis [40, 41]. In the present study, NGF promoted little if any change in expression of these RP transcripts. Thus, although NGF is an effective anti-apoptotic factor, these actions do not appear to be mediated by down-regulation of potentially death-inducing RPs. At present, in contrast to studies on bacterial and archael ribosomes, relatively little is known about the functions of individual mammalian ribosomal proteins (. However, assuming that changes in message abundance lead to alterations in protein levels, it is reasonable to anticipate that the NGF-promoted effects observed here may affect the protein synthetic capacity of the cell in some manner. Such changes are unlikely to be global; NGF does affect the cellular rate of protein synthesis, but this seems to be due at least in part to post-translational modification of the translational machinery . The alternative is that the changes reported here may result in selective effects on translation of specific messages. A final, and important possibility to consider is that a number of RPs appear to possess extraribosomal functions  and consequently that the changes reported here may lead to responses that do not directly relate to ribosomal function. For example, RP L18, which was significantly down-regulated by NGF, has been reported to negatively regulate double-stranded RNA (dsRNA)-activated protein kinase (PKR) . As an additional example RP S19, which is also down-regulated by NGF, has been implicated in erythropoiesis and has also been described as a monocyte chemotactic factor . As one last example, rat RP L9 which we found to be up-regulated by NGF starting within a few hours and maximally by 8 hrs, has been shown to be the ortholog of the yeast gene grc5 which appears to be involved in multiple cellular functions including growth control, cytoskeleton control and energy metabolism . Identification of NGF-regulated RPs should now facilitate exploration of their potential roles in the responses of cells to neurotrophins. SAGE analysis provides a reliable, quantitative picture of ribosomal protein expression in PC12 cells before and after long term exposure to NGF. Transcripts for ribosomal proteins are among the most abundant transcripts in the cells; however there is a wide range between numbers of transcripts for individual RP transcripts. NGF promotes an overall decrease in relative RP transcript expression (for the 74 RP transcripts detected, from approximately 5% of total transcripts to 3.5%). This drop represents a decrease in relative expression of individual RP transcripts as well as an increase in message complexity in NGF-treated cells. Long term NGF treatment of PC12 cells promotes statistically significant changes in expression of over half of the transcripts encoding ribosomal proteins. Decreases in expression outnumbered increases by a ratio of approximately 2:1. The largest observed changes in expression are in the range of 3–5 fold. For at least one RP transcript (RPL9) the response to NGF is rapid; an elevation is detected within 1 hr of NGF exposure and reaches maximum regulation by 8 hrs. Examination of the literature reveals many other reports in which expression of individual or groups of RP transcripts are regulated in response to growth factors, differentiation agents or malignant transformation. Comparison with the present data indicate that changes in ribosomal protein transcripts is regulated in a cell and state dependent fashion with a large diversity in the particular RP transcripts that are subject to regulation. Thus, although the ribosome may be regarded as a "machine" there is a good deal of potential for plasticity with respect to the expression of its various components. This raises the possibilities that growth factors and other cell regulators may affect ribosomal function, and thereby the capacity of cells to transcribe specific transcripts. In the absence of information about the specific functions of most individual RPs in mammalian cells, one can only speculate at present on the physiologic significance of the reported changes. However, it seems highly plausible that the observed responses may play roles in NGF-promoted neuronal differentiation. This may be mediated in part by selective effects on translation of certain messages. In addition, past findings support the possibility that at least some of the regulated RPs have extra-ribosomal actions that may affect neuronal differentiation and function. SAGE libraries were prepared from naïve and 9-day NGF-treated PC12 cells and sequenced as previously described . To match SAGE tags with RP transcripts, tags were initially analyzed with the National Center for Biotechnology Information (NCBI) rat SAGE tag to gene mapping database ftp://ncbi.nlm.nih.gov/pub/sage/map/Rn/Nla3, which matches possible 14-mer tags with known rat genes and expressed sequence tags (ESTs). With the use of sequences present in the NCBI UNIGENE rat database http://www.ncbi.nlm.nih.gov/UniGene/Rn.Home.html potential matches were further scrutinized to determine whether there was a match at the 15th base and to determine whether the matched sequence was at the most 3' end of a known rat transcript or EST. We considered only cases in which a clear poly(A) tail and a polyadenylation signal were present at the 3' end of the transcript or EST. Appropriate ESTs were further analyzed by an advanced BLAST search for matches with known rat RP genes. Monte-Carlo simulation analysis of the SAGE data was carried out using the SAGE 300 software package . PC12 cells were cultured as previously described  in complete medium (85% RPMI 1640 medium, 10% horse serum, 5% fetal bovine serum). Replicate cultures were treated with 50 ng/ml rhNGF (kindly donated by Genentech, Inc.) for the indicated times. Total cellular RNA was isolated as described previously  and 1.2 – 5 μg was used for reverse transcription with 5'-T30NN-3' primer using Superscript II Rnase H-RT according to the manufacturer's specifications (Life Technologies, Grand Island, NY). Quantitative real time PCR reactions were performed as described by Troy et al. . GAPDH was used to normalize input cDNA for samples originating from short-term NGF treatments and β-actin was used for this purpose for samples with long-term NGF exposure. Forward and reverse primers pairs used for quantitative PCR were: S29, 5'GGTATCACAGGGTAGACAGT3' and 5'GGTATCACAGGGTAGACAGT3'; L9, 5'GAACTCTGAGGAGGGACTTC3' and 5'AAACTGTACTTGTTATCAGGAT3'; S27-1, 5'CGGCACGAGCGACCTCCCTA3' and 5'GTTCCCACTCATCTTGAATC3'; L24, 5'CAAGAAAGGACAGTCGGAAA3' and 5'TTCACAGGCTTCACAATCTT3'; S19, 5'TAACCAGCAGGAGTTCGTCA3' and 5'TTTGTTCTAATGCTTCTTGTT3'; β-Actin, 5'ATCCTGACCCTGAAGTACCC3' and 5'TACGACCAGAGGCATACAG3'; and GAPDH, 5'GAAACCTGCCAAGTATGATGA3' and 5'TCTCTCTTGCTCTCAGTATCC3', respectively. We thank Claudine Bitel for her excellent technical assistance. Supported in part by grants from the National Institutes of Health.